A Church Retreat Near the Equator. This minor body orbits Sig in the L2 Lagrange-point of Andophael, meaning it is very close to Androphael and orbits Sig in exactly the same amount of time. Satira Pala is unique in that it always remains within the umbra of Androphael, never seeing sunlight. This has made it a perfect place for the Inquisitorial Crucible, which is the last year of their training. The moon is used for little else. The largest moon has mild volcanic activity that makes its climate an excellent temperate habitat. It supports a large civilian population, many of whom commute to Andophael. This moon in many way resembles what the Ancient Records tell us of the moon Titan in the Terran system. The thick methane atmosphere makes habitation on the surface impossible and visibility is limited to a few paces. This did not stop the Crusaders of the High Church, who took this place as their own and built the giant dome city of Drepanum. This is where the Crusaders are seated and where they live and train when on active duty. It is the only mark of civilization on the moon along with the spaceport. A seismically unstable frozen wasteland, with large sheets of ice shifting under tidal interactions causing the ejecta spewing out of ice-volcanoes to easily reach escape velocities due to the nearly non-existent atmosphere. Frequent ice-storms plague the surface. Tisoan is essentially an extreme reflection of Andophael itself, and only the most devout pilgrims and the toughest of Aquilan Legionnaires make the pilgrimage on this moon. The Sig System is one of the core systems of the Human Imperium in Acheron Roe, it is located in hex [HEX-COORD]. Compared to its neighbours and peers Sig is unusual in that it contains significantly fewer substellar objects than might otherwise be expected for a system of its type and age. Despite this it is perhaps the most culturally significant system of the Empire after Imperial Prime itself as it hosts Andophael; the Holy Planet and home-world of the High Church of the Messiah-Emperox, the imperial state religion. Millions of pilgrims from across the Empire make the journey to Andophael each year to walk Path of Virtue and visit the Grand Temple; bringing with them tithes, donations and commerce that form a significant part of the High Church's economy. The Sig System is a 'failed binary' system named after it's primary star, Sig-A, a type A blue-white main-sequence dwarf apoxmately 1.77 solar masses in size. Like other type-As Sig is very bright, emitting up to ten times the output of humanity's native star and with a much larger part of it being UV radiation. Additionally the star blows a strong stellar wind and rotates relatively quickly, producing a very potent stellar magnetic field. Its companion and also the innermost object of the system is Sig-B Shiva, a large M-Class brown dwarf of 0.061 solar masses that orbits Sig-A with a barycentre well within the primary, hence failing to classify the system as a true binary. Shiva has a very low luminosity and almost all of its emissions are in the infra-red part of the spectrum. The parts visible to the human eye appear a dark red-purple in colour. It takes 195 days for Shiva to complete one orbital period and it has no rotation of its own having been tidally locked to Sig. Sig-B Shiva also posseses an impressive ring system known as the Emperox's Halo for the unusual visual effect produced when the brown dwarf passes across Sig. On Andophael a day when such an eclipse will be observable from the surface is considered a holy day and almost all pilgrim travel packages and self-planned pilgrimages will coincide with one of these days. According to the High Church's astronomy lectors the Halo was formed from planetary debris in the earlier stages of the system's development. It would have been a very violent time as Shiva's enormous (relative) mass was extremely disruptive to the inner system, spelling doom for the other astronomical bodies by disrupting their orbits. Most of these would have fallen towards either Sig or Shiva and been torn apart by tidal forces with their remains across the system. Some could have ended with direct impacts while others may have even been thrown out of the system entirely. 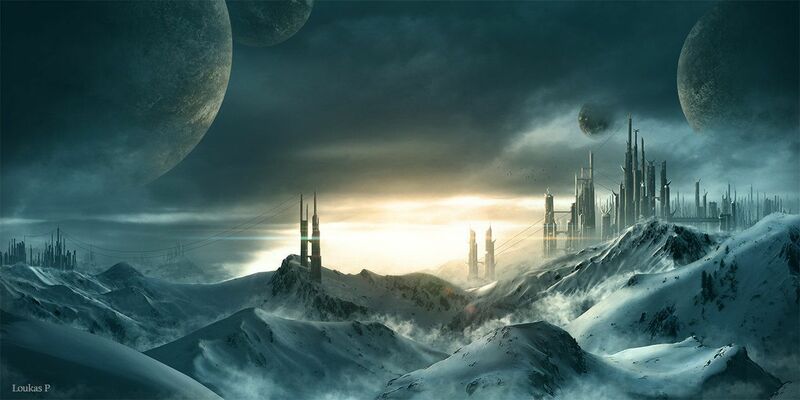 There is a ruined pre-scream deuterium mining facility in orbit of shiva, however the technology and expertise required to operate it no longer exists in the Empire so it currently cannot be restored. The only interest in it is from salvagers and scrappers. The planet Andophael, the next object in the Sig system, is the lone survivor of Shiva's wrath having formed far enough away to escape the deadly gravitic influence. It is not unaffected or unscathed however, having suffered numerous impacts with debris. The largest of which resulted in the Eye of Providence crater. Also Andophael has four moons, all of which were 'captured' by the planet after they were thrown out of Sig orbiy by Shiva. Fortuitously, or perhaps, miraculously, their combined tidal effects work to heat and drive the planet's otherwise inert core without which the powerful magnetosphere that protects the surface from Sig's intense UV radiation would not exist. Though of course as a consequence of being so far out it also experiences extremely cold temperatures despite the intense luminosity of Sig, with almost no liquid water on it's surface at all. Andophael is slightly larger than ancient earth but also less dense, giving it a surface graity of just below human native at 0.97 G.
The Necropolis is a large belt of asteroids and planetoids that orbits Sig beyond the orbit of Andophael. Some of the material in the belt is simply left overs from the formation of the system but much of it is made up of inner system debris, givng rise to its sombre name. Three objects in the Necropolis are large enough to be classified as dwarf planets, one of which, Covenant is home to a small monestary. As well as reflection, meditation and contemplation the Monks and Nuns there mine cobalt and mostly work it into various art objects which are then sold to pilgrim on Andophael to support the Monestary. Sheol is the second planet and final part of Sig's planetary system. It is an extra-solar capture much older than the Sig system itself, one of the reasons that the Fitzroy 7 research base is located there. Sheol seems otherwise unremarkable. It is a small world made of rock and ice that has a very thin atmosphere of nitrogen and hydrocarbons, brough about by exposure to cosmic radiation. It has a mass of about 0.04% that of Andophael and surface gravity of 0.15 standard G. In 3211 the planet will have completed it's first ever full rotation around Sig since it was first observed by humanity.